Merriman Smith won the Pulitzer Prize for covering the assassination of President Kennedy, but he was perhaps even prouder of the bruises inflicted by a rival reporter trying to grab the phone he hogged to file the scoop of a lifetime. On a day when every minute mattered in an era of slow-motion communication, the White House correspondent for United Press International seized the sole radiophone in the press car when he heard shots fired at the presidential limousine ahead of him in the Dallas motorcade. And he never let go. Although the Associated Press reporter frantically clawed and pummeled Smith as the car driven by a Secret Service agent raced to Parkland Hospital at 60 miles an hour, the mustachioed Unipresser hunkered down and kept filing, scoring a clean beat. Smith’s achievement is a perfect example of how the need for speed in the old days dominated the news business to such an extent that reporters would lie, cheat, beg, borrow or steal for a scoop. But that was then and this is now. Nobody's working for Merriman Smith’s UPI. And speed, ironically, is far less important than it used to be. Today, anyone with a TV or Internet connection can not only tap into an incessant flow of information but also contribute his own two cents through any of the several do-it-yourself media. If newspapers have a chance at surviving in the future, they will have to stop trying to compete with Matt Drudge, Gawker and the picture-phone paparazzi – and start playing to their own formidable and sorely needed strengths. Those strengths, lest we forget, are the ability to deliver not just timely information, but also factual, fair and balanced reporting that identifies, explains and illuminates complex events. For all that I have published here in the last two years, nothing has generated a stronger (or more interesting) response than my assertion that newspapers are squandering their increasingly scarce resources by filling their websites with 24/7 flashes about snowball fights, drive-through flu clinics and Christmas light shows at RV parks. That is not to say it isn't a great thing to be the first to break a big story or that major news developments shouldn't be rushed online as fast as humany possible. But the sudden arbitrary emphasis on producing an all-day stream of trivial bulletins will dangerously devalue both the print and online products by taking time away from the work necessary to produce truly significant coverage. The primary defense of quickie web coverage comes from folks who argue that any matter coming to the attention of a newspaper, ipso facto, should be published as rapidly as possible. With all due respect, this argument fails to comprehend the profound paradigm shift that has changed everything about the newspaper business. 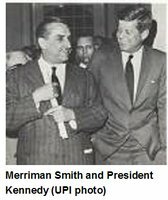 When Merriman Smith worked at UPI, the problem the wire service solved was hastening the flow of scarce information to the limited number of newspapers and broadcast outlets with the capability to disseminate it. Because the major media had tight and inflexible production windows, late news was no news. And that was bad news. The problem newspapers must solve today is quite the opposite. With everyone tethered to cell phones, cable TV news, instant messaging, Google News and so much more, consumers are overwhelmed with information every waking minute of the 10,080 minutes in a week. :: First, they can organize news and information in well conceived, well presented and coherent print, online and mobile formats. :: Second, they can deploy interactive systems to give consumers the ability to slice and dice information in the way most useful to them. With so much to be done, there’s no time for busy work.